Including this LA magician… Magic Johnson. 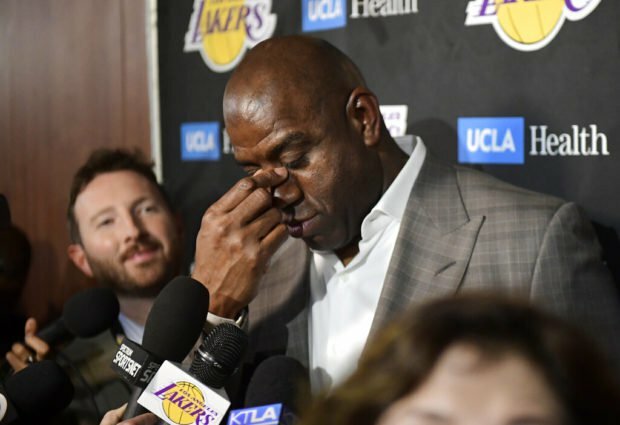 Magic Johnson abruptly quit as the Los Angeles Lakers' president of basketball operations on Tuesday night, citing his desire to return to the simpler life he enjoyed as a wealthy businessman & beloved former player before taking charge of this franchise just over two years ago. Johnson didn't tell owner Jeanie Buss or general manager Rob Pelinka about his decision before he announced it in front of reporters about 90 minutes before the final game of the Lakers' sixth consecutive losing season. Los Angeles was 37-44 heading into its game against Portland, missing the playoffs yet again despite the offseason addition of LeBron James. Johnson didn't directly tie his decision to the future of Luke Walton, but the third-year coach was widely expected to be fired by Johnson. Without using names, Johnson repeatedly mentioned Buss' affinity for Walton, who was in place before Johnson got the job in February 2017, & Johnson's desire not to cause upheaval between the owner & her chosen coach. Climb on The Family Tree below & share your thoughts about My Nephew Magic Johnson’s resigning situation. Jan 2 Kudos… Kobe & Wife Expecting 4th Mambacita!! !